My last post focused on the use of the ctree procedure in the R package party to build classification tree models. These models map each record in a dataset into one of M mutually exclusive groups, which are characterized by their average response. For responses coded as 0 or 1, this average may be regarded as an estimate of the probability that a record in the group exhibits a “positive response.” This interpretation leads to the idea discussed here, which is to replace this estimate with the size-corrected probability estimate I discussed in my previous post (Screening for predictive characteristics). Also, as discussed in that post, these estimates provide the basis for confidence intervals that quantify their precision, particularly for small groups. In this post, the basis for these estimates is the R package PropCIs, which includes several procedures for estimating binomial probabilities and their confidence intervals, including an implementation of the method discussed in my previous post. Specifically, the procedure used here is addz2ci, discussed in Chapter 9 of Exploring Data in Engineering, the Sciences, and Medicine. As noted in both that discussion and in my previous post, this estimator is described in a paper by Brown, Cai and DasGupta in 2002, but the documentation for the PropCIs package cites an earlier paper by Agresti and Coull (“Approximate is better than exact for interval estimation of binomial proportions,” in The American Statistician, vol. 52, 1998, pp. 119-126). The essential idea is to modify the classical estimator, augmenting the counts of 0’s and 1’s in the data by z2/2, where z is the normal z-score associated with the significance level. As a specific example, z is approximately 1.96 for 95% confidence limits, so this modification adds approximately 2 to each count. In cases where both of these counts are large, this correction has negligible effect, so the size-corrected estimates and their corresponding confidence intervals are essentially identical with the classical results. In cases where either the sample is small or one of the possible responses is rare, these size-corrected results are much more reasonable than the classical results, which motivated their use both here and in my earlier post. The above plot provides a simple illustration of the results that can be obtained using the addz2ci procedure, in a case where some groups are small enough for these size-corrections to matter. More specifically, this plot is based on the Australian vehicle insurance dataset that I discussed in my last post, and it characterizes the probability that a policy files a claim (i.e., that the variable clm has the value 1), for each of the 13 vehicle types included in the dataset. 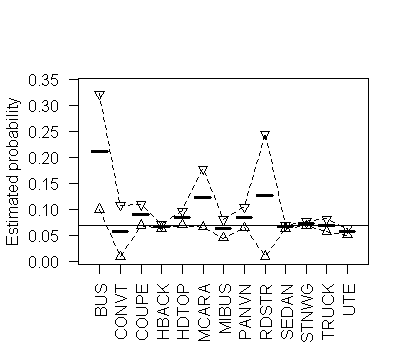 The heavy horizontal line segments in this plot represent the size-corrected claim probability estimates for each vehicle type, while the open triangles connected by dotted lines represent the upper and lower 95% confidence limits around these probability estimates, computed as described above. 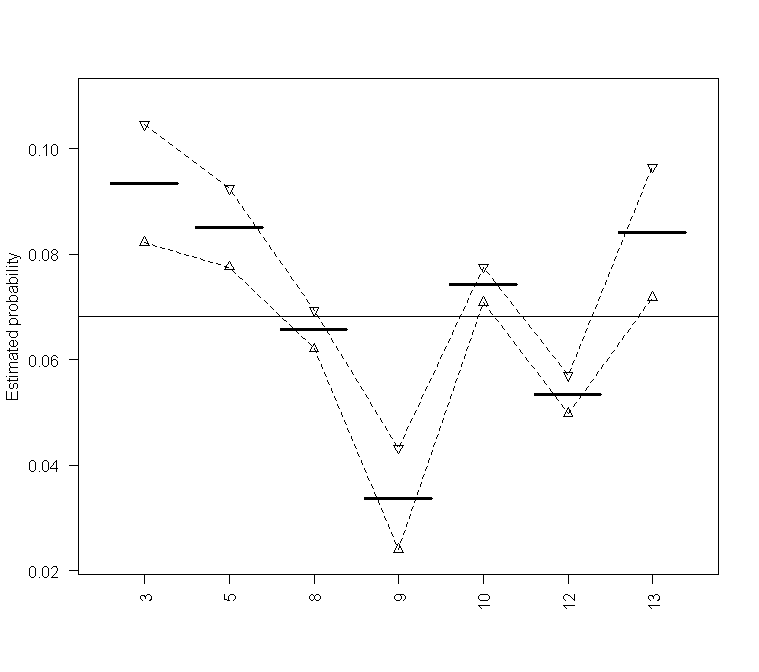 The solid horizontal line represents the overall claim probability for the dataset, to serve as a reference value for the individual subset results. An important observation here is that although this dataset is reasonably large (there are a total of 67,856 records), the subgroups are quite heterogeneous in size, spanning the range from 27 records listing “RDSTR” as the vehicle type to 22,233 listing “SEDAN”. As a consequence, although the classical and size-adjusted claim probability estimates and their confidence intervals are essentially identical for the dataset overall, the extent of this agreement varies substantially across the different vehicle types. Taking the extremes, the results for the largest group (“SEDAN”) are, as with the dataset overall, almost identical: the classical estimate is 0.0665, while the size-adjusted estimate is 0.0664; the lower 95% confidence limit also differs by one in the fourth decimal place (classical 0.0631 versus size-corrected 0.0632), and the upper limit is identical to four decimal places, at 0.0697. In marked contrast, the classical and size-corrected estimates for the “RDSTR” group are 0.0741 versus 0.1271, the upper 95% confidence limits are 0.1729 versus 0.2447, and the lower confidence limits are -0.0247 versus 0.0096. Note that in this case, the lower classical confidence limit violates the requirement that probabilities must be positive, something that is not possible for the addz2ci confidence limits (specifically, negative values are less likely to arise, as in this example, and if they ever do arise, they are replaced with zero, the smallest feasible value for the lower confidence limit; similarly for upper confidence limits that exceed 1). As is often the case, the primary advantage of plotting these results is that it gives us a much more immediate indication of the relative precision of the probability estimates, particularly in cases like “RDSTR” where these confidence intervals are quite wide. Recall that this formula specifies we want a classification tree that predicts the binary claim indicator clm from the six variables on the right-hand side of the tilde, separated by “+” signs. 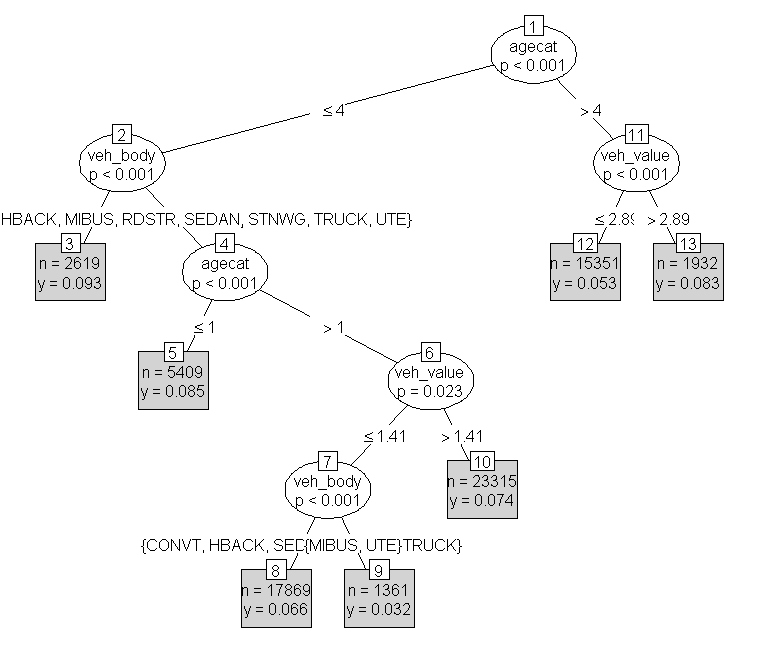 Each of the terminal nodes in the resulting ctree model is characterized with a rectangular box in the above figure, giving the number of records in each group (n) and the average positive response (y), corresponding to the classical claim probability estimate. Note that the product ny corresponds to the total number of claims in each group, so these products and the group sizes together provide all of the information we need to compute the size-corrected claim probability estimates and their confidence limits for each terminal node. Alternatively, we can use the where method associated with the binary tree object that ctree returns to extract the terminal nodes associated with each observation. Then, we simply use the terminal node in place of vehicle body type in exactly the same analysis as before. The above figure shows these estimates, in the same format as the original plot of claim probability broken down by vehicle body type given earlier. Here, the range of confidence interval widths is much less extreme than before, but it is still clearly evident: the largest group (Node 10, with 23,315 records) exhibits the narrowest confidence interval, while the smallest groups (Node 9, with 1,361 records, and Node 13, with 1,932 records) exhibit the widest confidence intervals. Despite its small size, however, the smallest group does exhibit a significantly lower claim probability than any of the other groups defined by this classification tree model. The primary point of this post has been to demonstrate that binomial confidence intervals can be used to help interpret and explain classification tree results, especially when displayed graphically as in the above figure. These displays provide a useful basis for comparing classification tree models obtained in different ways (e.g., by different algorithms like rpart and ctree, or by different tuning parameters for one specific algorithm). Comparisons of this sort will form the basis for my next post.